The baker turned to face us with a smile as he slid several of the puffy, golden loaves out of the wood burning oven. On a nearby table, a pot of melted butter waited to be the finishing touch on the irresistible dough. As soon as the loaves could be wrapped up, the trays of sugar cake would take their place in the oven. A version of these actions takes place every day at the C. Winkler Bakery in Old Salem. Sometimes it’s gingerbread; other times, tea cakes or the famous Moravian sugar cookies. This is life in an 18th-century town. 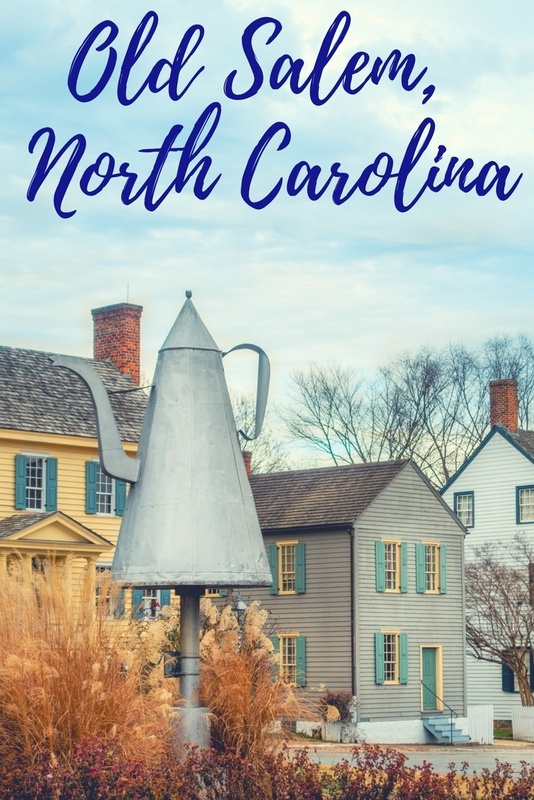 Throughout North Carolina’s Old Salem Museums and Gardens, skilled craftsmen and interpreters live and work as though it were the late 1700s and early 1800s. Visitors can see the cobbler hand-crafting shoes in the Single Brothers’ House, yarn being dyed for weaving, and men making guns in the T. Vogler gunsmith shop. They can stop by the Tavern in Old Salem for bratwurst and beer like George Washington did when he stayed there in 1791. There are carpenters, tinsmiths, and potters all practicing their trades while interacting with visitors to Old Salem. Some of their goods (along with other souvenirs) are sold at T. Bagge Community Store. Every building has a story. In the Doctor’s House, we learned that Dr. Vierling wasn’t just a doctor—he was also a dentist, pharmacist, and veterinarian. 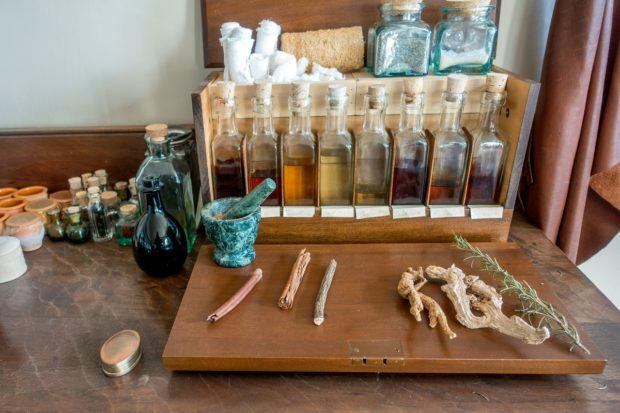 We saw supplies like the kind he would have used and learned about the types of treatments available to the original residents of Old Salem. Female sisters showed us how clothes were made and talked about all the other duties that kept the household running. In the Vogler House, we saw jewelry and silver works done by its owner and learned more about life in the mid-1800s. At the Miksch House—the first single-family dwelling in Old Salem, North Carolina—men worked in the garden growing vegetables while women demonstrated various cooking and food preservation techniques inside. Throughout the year, the garden and kitchen are busy places full of seasonally-appropriate activities. The first time we visited in the fall, it was time to dig up some of the last root vegetables of the season, and apples were being harvested. Inside, the menu included venison stew with carrots from the garden, and pickled beets were being preserved with homemade cider vinegar. On our second visit in the winter, cold weather crops were being tended and harvested. A stop here is truly a peek inside life in the 1770s. But why the 1770s? Why here? Salem was originally settled in 1766 by members of the Moravian Church, a Protestant denomination that began in the 1450s in what is now the Czech Republic. Many of the Moravians in North Carolina had moved south from an earlier settlement in Bethlehem, Pennsylvania. Over time, Salem became the economic center of the area known as the Wachovia Tract, with a bakery, tannery, and slaughterhouse. It was even home to both a brewery and a distillery. The craftsmen of Salem were known for producing tools, ceramics, and metals, and the town had extensive gardens and orchards to feed its citizens. The residents of Old Salem lived, worked, and worshiped together. They did not own the land where they lived but instead leased it from the Moravian church, with the money ultimately going for community expenses. The church governed all aspects of life, even encouraging education for both sexes at a time when schooling for girls in the South was irregular, at best. Though industry moved in and Salem merged with nearby Winston to form Winston-Salem in 1913, the Moravian cultural and historic preservation continued. 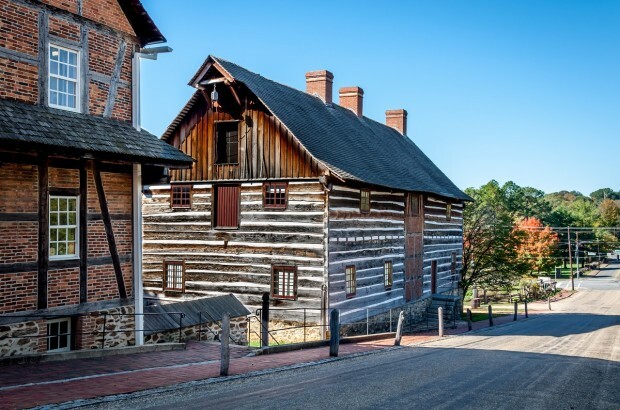 Thanks, in large part, to meticulous records kept by the settlers, the buildings of Old Salem have been renovated and reconstructed when necessary to reflect life from 1766 to 1860. Of the 91 original buildings in the town today, approximately 20 buildings and gardens are open for visitors. Before visiting Old Salem Museums and Gardens, our expectations weren’t particularly high. We’ve seen a number of living history museums over the years. Some good, some not-so-good. It’s easy for the history to become dry and the interpreters to seem like actors. But Old Salem is nothing like that at all. At Old Salem, the history is truly living with the real activities of daily life taking place before your eyes. The workshops are engaging and authentic, and the buildings themselves are fascinating to look at. The interpreters are genuinely interested in being true to history and in communicating to the visitors their love for what they’re doing…starting with the onion bread. Stop by the Old Salem bakery for a snack or treats to take home. The Moravian sugar cookies, sugar cake, and hot cross buns are top choices. We absolutely loved the cherry strudel we picked up. Head upstairs to enjoy a pastry and coffee. The Tavern in Old Salem and the Flour Box Tea Room & Café offer more substantial fare. The Tavern has hearty meals inspired by Moravian traditions and made with local North Carolina ingredients. The Flour Box is a great stop for salads, sandwiches, tea (of course), and delicious cakes. Any time of year is a good time to visit Old Salem. In the spring, visitors can experience traditional Easter activities, visit the Gardens of Old Salem, and attend the Spring Festival at the Doctor’s House. Summer brings Fourth of July celebrations, concerts, and unique demonstrations. The fall is all about the harvest with activity at the Miksch House and the Harvest Day event—not to mention how pretty the grounds are as the leaves change. 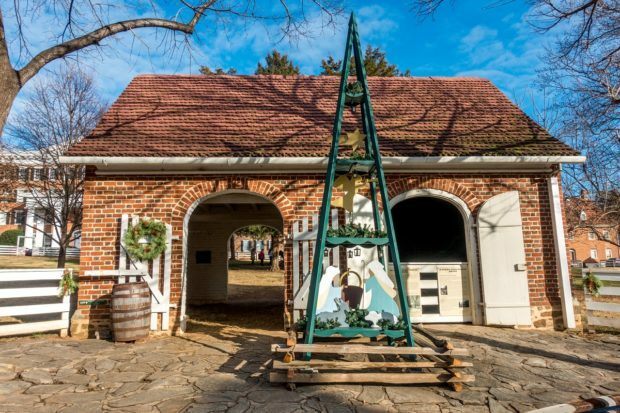 In the winter, Old Salem Museum and Gardens comes alive with the sights and smells of Christmas. There is hot chocolate, ginger cookies, music, and a mix of German and American Christmas decorations. And an Old Salem Christmas isn’t complete without a candlelight tour. On both our visits to Winston-Salem, we’ve stayed at the Historic Brookstown Inn, a former 19th-century mill less than a half-mile from Old Salem Museum and Gardens. Decorated with art from local artists, the red-brick building hotel is full of charm and history. And you can’t beat the nightly wine and cheese happy hour or the milk and cookies later in the evening. 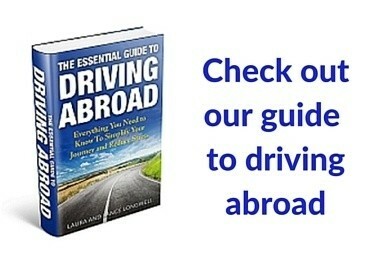 We were the guests of Visit Winston-Salem, Visit North Carolina, and the Brookstown Inn. 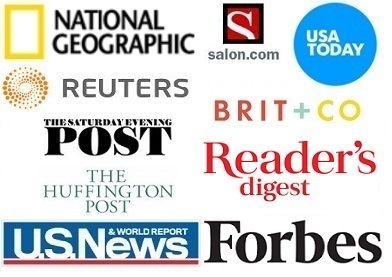 All opinions of the historically fascinating are our own. Have you ever visited Old Salem? What did you think? 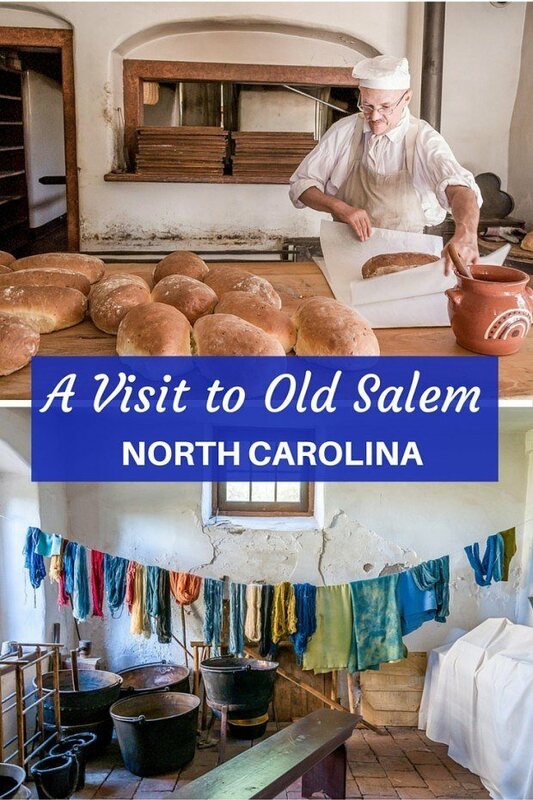 What do you think about Authentic Living at Old Salem in North Carolina? I am adding Old Salem to our itinerary. Looks like so much fun. Well please do not waste your time going to Old Salem. My friend and I drove over 100 miles to see the place and the shops and places that they have advertised are no longer in existence. 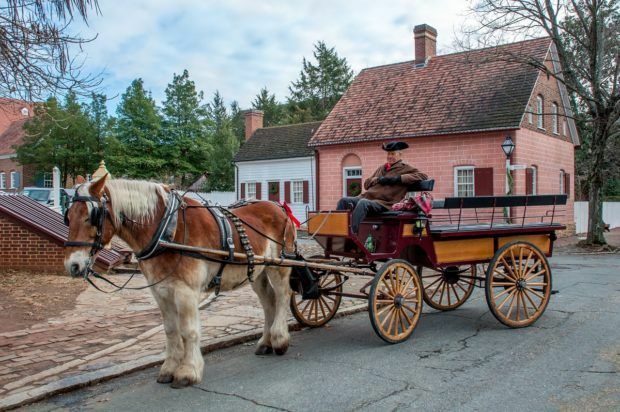 Practically all of the places which are advertised on the internet as being places at Old Salem that people can visit are now privately owned buildings and the public can no longer enter them. Do not expect to see people making pottery, baking, making candles, making shoes, making things with metal, quilting, making medicine, etc. They brag about the church and their Tavern—the tavern was closed and I could simply take a peek through the window to get the same rate of tour that I got of the church. Their director was rude. There was nothing at all really connecting to the spiritual side of their earlier life there. It has been totally secularized . The Moravians no longer own it—it has been sold out to other businesses that now own it. I’m sorry that was your experience. That doesn’t align with our visits. Things are quieter at certain points of the year or certain days of the week, but they’re actually running an expanded program on Saturdays in the spring right now. It includes things like a hands-on experience in the bakery, a group quilting party, organ concerts, and a joiners workshop, in addition to the other presentations by interpreters in the different buildings.